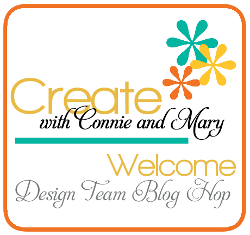 Welcome everyone to the Create with Connie and Mary Saturday Design Team Blog Hop where the FABULOUS designers pick a theme and we each off a project based on that theme. For the month of August we are going to be having fun with the new incolors. This week we are taking a look at MINT MACARON! I do LOVE this new incolor! Very Vanilla – 2 7/8 x 5 1/2, cut out one end using the Lots of Labels Framelits then cut down so that finished length is 5 3/8, stamp greeting using Mint Macaron and Basic Black Markers. 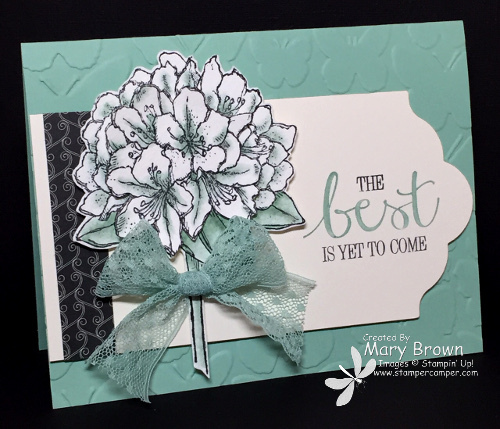 Timeless Elegance – 5/8 x 2 7/8, add to label then add label to card front using dimensionals. Stamp flower twice using StazOn Jet Black on Watercolor paper. Color using Mint Macaron marker and blender pen. Cut out. The second one you are cutting out some of the flowers in the center, curl up edges and add using dimensionals. Add using dimensionals. Tie bow from the Mint Macaron 1″ Lace Ribbon and add to card front to finish off. Let the party begin! We’ve change the way to get from one blog to the next to use the buttons below to go either backward (previous) to the Connie’s site or forward (next) to the very talented Nicole Tugrul. This entry was posted in Create with Connie and Mary, Saturday Blog Hop and tagged Best Thoughts. Bookmark the permalink. The lace really gives it a step up look. Thank you for the hop. Simply gorgeous, Mary! The subtle mint coloring on the flower is beautiful!!!! Love this stamp set, too!